As I said in the podcast post, you should notice that there is more going on around here than there has been in the last few weeks. We were taking a break because of the post-E3 news drought, and because we just wanted to chill a bit. It’s funny, because for some reason, I took a break from gaming in general, save for the daily StarCraft 2 ladder match. So, now that the gaming season is kicking back into high gear, I’ve been trying my hand at a few games lately. For one, I picked up Bastion, and have played just a bit of that lately. I’m really enjoying the presentation, and it helps that the gameplay is solid, too. On top of that, I’ve been knocking out some Civilization V, which I’m enjoying as well. But for me, though, the crown jewel of my gaming life the last two days has been Final Fantasy Tactics: War of the Lions on iPhone. For those unaware, this is the PSP remastered version of Final Fantasy Tactics, one of my favorite games of all time. The idea that it’s in my pocket whenever I want to play it is kind of incredible, and already I’m sucked right back into it. Seriously, if you have never played this and have an iPhone, get it. So what about you guys? What are you playing? Go! Lately my free time has been spent watching Battlestar Galactica with a friend of mine (who is watching it because of my recommendation, as it is my favorite show ever). I’m playing the occasional Bastion and Starcraft when we’re not doing that, and since we are on the last season, I’m hoping I can start and finish Witcher 2 which I’ve had for months before Gears 3 comes out, which I had the epiphany this week actually comes out NEXT MONTH. So excited, and I would love to do a Gamer Sushi game night on that game. I’ve been playing the original Deus Ex in anticipation for Deus Ex 3, and I’ve also gone back and replayed Fallout 3 as an Evil character on Very Hard mode. Fun stuff, but I still can’t manage to finish New Vegas. I get so overwhelmed by my 15 active quests, 8 of which are for the finale. I think, idk. 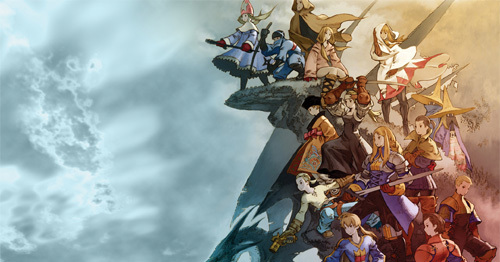 btw, I love the FF Tactics: War of the Lions picture! I agree that Tactics is awesome, and it’s my favorite Strategy game and Final Fantasy game (Fire Emblem is a close second for favorite Strategy). Inspired by EVO, (a friend of mine was invited to compete in the tournament, but he lost his first two matches) I picked up Super Street Fighter IV: Arcade Edition and have been playing a lot of that online. I haven’t played SF regularly in probably 15 or so years and my record now stands at something like 20 wins in 160 matches, but I’m getting better…I think. I also just borrowed my brother’s copy of LA Noire, so I’m looking forward to starting that. Still playing my usual CS and occasional CS:S. Picked up Limbo when it came out on Steam and it’s absolutely fantastic. I’m so happy it was finally released on Steam. THEN I saw today that Bastion is coming to PC too, so I’m waiting for that. Season 4 of Breaking Bad has also begun, and for those of you who haven’t seen that show, do yourself a favour and check it out! I finally grabbed Limbo, now that its out on Steam, so I’m about an hour into that. Still slowly working my way through Assassin’s Creed, and about to start on Deus Ex too. Lately I’ve been programming a tech demo for a tactical RPG. As far as games I’m actually enjoying, I’m playing a ton of Team Fortress 2 again, warming up to some of the other classes. I also picked up a ROM for Earthbound, and that game is fantastic. It’s probably one of my all-time favorite SNES games. My next plan is to import Mother 3 and then get the translated ROM for the game (so that I still can support the developer). I’ve been getting back into Civilization V, and replaying L.A. Noire. Playing plenty of multiplayer with my pals in Halo: Reach and a little Black Ops. A Friend of mine recently got steam and the first thing he did was buy Counter Strike, so I am definitely going to play that with him. Also when is this SC2 game night going down, or did I miss it? Like Julez & supernovaforce I’m playing Limbo since it came out on PSN recently. I’ve been dipping in and out of it. It’s brilliant. Other than that? Nothing really. I haven’t got a new game (excluding downloadable titles) in a couple of months. That’s due mostly to farming (hay primarily FYI) and meeting up with friends or my girlfriend. BFBC2 gets a go now and again though. I’ve also been mighty tempted by Crysis 2 and Portal 2 as Game.co.uk has pretty decent price tags on both. I may get Crysis 2 now as I want a new shooter and tried it at a store recently and was impressed with what I saw (both visually and with the mini-sandboxes). In addition to the ol’ farm, reading has taken up an increasing share of my spare time (a very good thing). I plan on getting Game of Thrones started next week (finally)! I’ve been laddering and BMing my friends in StarCraft 2. I’m also going to give Brink’s free weekend on Steam a try. I’ll let you know what I think. Lately I’ve actually been getting into some last gen games. I’m switching between Final Fantasy X-2 (which I’m actually liking a lot more than X) and Metal Gear Solid 3. I’m right before the fight with The Boss in MGS 3 so I think I’m pretty close to the end. My 16th birthday is this Wednesday and for my present my Ma is going to kick some money towards upgrading my gaming PC. Once I’ve done that I’ll probably buy and play the s*** out of Shogun 2: Total War. The game is essentially an advertisement for WH40K: Space Marine, but it’s a fun game for $10 if you’re into 40K. The lack of online co-op really hurts it, though. I’m sure the omission has something to do with the fact that THQ folded the game’s developer shortly before it’s release. It’s a shame, really. Warhammer fanboys like myself would have happily paid another $10 every few months for an expansion. At least I can look forward to Space Marine. PSN offered Borderlands and all the DLC for $20 for a few days in July. I picked it up, figuring I had nothing to lose. Holy crap. Great combo of RPG and FPS, and I’m putting in 3 hours a day…and that’s working a full-time and sharing a television with the wife.